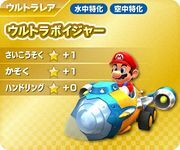 The Ultra Voyager is one of Mario's special Karts in Mario Kart Arcade GP DX. The kart has four small wheels, and its body is colored yellow and light blue and has a round metal nose. The back of the kart has two boosters and the emblem of the character that the player has chosen. The boosters do not affect gameplay. The Ultra Voyager's Type S alternate color is blue and orange while Type X's color is gray and red. This page was last edited on March 6, 2018, at 19:01.